After spending the week in Santa Barbara for the Surf and Serve trip, Team Fink reflects on their experience. Thank you Simply Venture for making this trip possible! One action can have an effect forever. The service we did in the community garden was super meaningful to me because I got to see the way my work the year before had given a lasting impact. It felt so fulfilling to sit on the tree stumps we had moved the year before, and gave me such joy to look at the tree I once gave a ‘haircut’. Little actions can change the world, like how our energy can change the dynamic of a room. We pulled weeds, we put down cardboard, we poured mulch. We worked, but it was fun and satisfying. We left an imprint. Although it is just a small garden, it could be the start of something bigger. The community garden also helped us grow closer together and commune. Our class worked hard and it was amazing to know that we can have fun while serving. I hope that I can go back next year and realize the beauty our work has left again. “The sea is really only drops of water that have come together.” (Desmond Tutu). What will our drop be? At the top of the mountain I saw sights I never thought were even real. When I was sitting on top of a rock I looked out over Santa Barbara and saw all of Gods creation. As I watched and observed the beautiful world that the Lord has created, I also reflected on my self and on my character. When we were on top looking out over the world I could feel that God was with me in that moment and truly feel peace in this world of chaos. Who knew that in this crazy world there are still areas of peace and comfort. I now know more than ever that the Lord is always with me even in the hard and scary times. Now back to reality, noise, crowds, and hurry are in my life once more. As I try to find peace like I had on top of the mountain, I get distracted by a ding on phone or the smell of bacon and eggs. Having joy and finding peace relates to Foster on the subject of taking time from the world and giving it to God. Isaiah 55:12 “You will go out in joy and be led forth in peace; the mountains and hills will burst into song before you, and all the trees of the field will clap their hands.” This bible verse stood out to me for the peace and the love He gives us. We need to go out in joy to truly experience peace from the Lord. The world is our sandbox. We went surfing, biking and served the homeless in California. It was our last day in Santa Barbara and the trip was starting to come to an end. In the process not only did we get to go to California, but we created memories with each other that will last a life time. This might have looked different to everyone but I have a feeling we all had a lot of fun. We walked the boardwalk, played on the beach went to the candy store and some shops. Ricky and I even met Brodie Smith!!! The point was that our memories stick with us forever and we can choose to make that good our bad. “We don’t remember days we remember moments.” (Cesare Pavese) The last day was a reminder to us that we have all those good memories and still continue to make them. This years Santa Barbara trip created so many good memories for all of us. Life is full of memories, make sure to cherish the good ones. During our class trip to Santa Barbara we went to PATH (people assisting the homeless). This honestly wasn’t a period of the trip I was super exited about because I figured it would be mostly kitchen work and food prep. The trip to PATH turned out to be probably the best part of the whole trip, for me at least. We all started out working in the kitchen which was just fine. We did tasks to prepare food which is necessary. If service was always fun and exiting more people would be drawn to it. After food prep we ate lunch. I was pretty tired so I decided I was just going to sit down and play the piano for a few minutes (I didn’t really want to), grab lunch and go hang out with my friends. So I sat down and started playing what I could remember, when this homeless man named Garvin came and sat by me. Garvin asked me what I was playing and then he asked if he could show me a few things. He taught me music I’d never played before, and it really ended up being super meaningful. An hour later I got up. I came to PATH thinking I would be serving people and giving to them. I think they did a better job of helping and serving me. I thought I was completely different than the homeless man but there are things that can tie us all together. Music is one of those things and it shows that we’re not different at all. Sometimes the world seems ridiculous, but then there are times where people truly show unique qualities, sometimes the people we’d least expect. When we went to the homeless shelter and led the church service I was thinking how privileged I am to meet these homeless people as if they were famous. I met this man named Lamar, the definition of Lamar in Arabic is “Liquid Gold”, and that is what I saw in him. Just to sit in a room and listen to Amazing Grace with all of these amazing people was a privilege. I learned a lesson that is go find the most intimidating people and talk about God and see what happens. “It’s not how much we give but how much love we put into giving.” -Mother Teresa This means to me that when we give something we should have a purpose of love. Overall this trip gave me freedom. This Santa Barbara surf and serve trip was incredible. This trip had so many highlights that I will always remember. One of the main highlights for me on this trip was surfing. I had never been surfing, and it was a new and exciting experience. After many tries and failures, after being crushed by the waves, and finally conquering my first wave, I learned that you can never get something perfect in the first try. An individual must practice and learn from those mistakes and failures. Once you learn from those mistakes you will be better then you were. Personally, when I fail it makes me motivated and more determined to work even harder. The most memorable part of this trip was when we all put away the surf boards and went into the ocean as a community. We laughed, splashed, and jumped waves as a whole. Being in a community, that is what I loved most about this trip. On our trip to California we got to go surfing. On our first full day is when we went surfing. Once we arrived at the beach we split up into groups. A couple of kids would go with one instructor, and my surf instructors name was Lang. When we got out on the water I was so excited to surf with my friends. I can still remember how beautiful the water was. The first wave that I tried to catch was too small and I fell off of the board, but that’s what made it fun and what made me want to try harder. The first wave that I stood up and surfed was after three tries of falling off of the surf board. When you were surfing or swimming to get to a wave the water would pull you to the left. So you would have to get out and walk back or you would go to far out. When Alli, Macie, Lang and I started to walk back, I tripped on the cord that wraps around your ankle and fell on my face when lots of people were watching me. That was one of my embarrassing moments of the trip. After surfing a long time with Lang I went back to the beach and started to surf with Liselle. I surfed with her for a while and she taught me how to evenly balance my weight to catch bigger waves. Something I found really fun was falling off the board. An example of when I did that was when I tried to catch a wave but I didn’t turn all the way around, and my board flipped over. I was pretty tired at that point and went back to the beach and put my surf board down. All of my class was playing in the water, and I went to join them. We were jumping over waves and splashing each other. Our class got really close and we were all in community. “And let us consider how we may spur one another on toward love and good deeds, not giving up meeting together, as some are in the habit of doing, but encouraging one another and all the more as you see the day approaching.” Hebrews 10: 24-25. At the beginning of the year our class was in two groups and I feel like even on the first day in California was a bonding experience. This week we went on a trip to Santa Barbara. We had a a lot of fun on the trip doing many different things. We went surfing, biking, and hiking and we were able to serve. I thought the most powerful moment was the bike ride. I think bike riding is powerful to me because on the way to the dirt park there was a gap jump and I did it and failed. However, I thought to myself to try, try, try, again. That part of the bike ride was a great day for me and it was very powerful. The other part was seeing the amazing view of the ocean because I thought of all the people in the world that are trying to succeed. Their failures are what encourages their successes. It is always good to have your eyes be open to seeing Gods hand prints all over the world. The hike we did was just a small fraction of what God has done. Even though it was in the dark and people were laughing, falling, slipping, scraping their knees, “Macie”. You just could tell that God was walking that hike with us. When one person would slip it was almost as if God had come in front of that person and caught them. My favorite part about that night hike was when it was totally dark. You can’t see where you are going at all. It reminded me of how life goes. It was light for for just a little while but then it got totally dark. We had to walk through it with out seeing. How in life we walk through life not prepared and can’t see what is next. “Even though I walk through the darkest valley, I will fear no evil” ( Psalm 23:4). Sometimes we will laugh. Sometimes we will cry. We will always fall, but God will come and catch us before we hit the ground. I yelled at Fink so many times to turn on a light. We yell at God for not shining a light on our dark path. God will choose when to shine the light on our path. Santa Barbara was an amazing experience that changed my views on the homeless. In particular, there was an experience that opened my eyes and heart the most. One night we went to serve the homeless at a shelter. We led a church service and a few homeless people attended. I realized that being with the homeless helped me to pay attention and learn more. I was immersed in God with these people because it was new to me. “It is not a strange place, but a new one.” (The Alchemist). I have been with the homeless before, but I have never been able share the love of God with them. I was able to listen more because the homeless inspired me. I had the feeling that the homeless people weren’t there to brag to others, or to gain a reputation but they were there to praise God. The homeless didn’t care what people thought of them. The homeless had a plan to praise and love God. The most touching moment for me was when John was preaching. I looked back and saw a man with tears in eyes. At my church I have never seen a person cry during a service because they recognized Gods love for us. “I stand at the door and knock …” was originally penned for believers, not unbelievers” (Rev. 3:20). Society is so hooked on noise, crowd, and hurry that people do not pay as much attention about noticing and observing everything God has done for us. God tries to show us everyday. The homeless are disconnected from society because the ones who believe in God are the ones that truly believe. The homeless don’t go to church to prove that they should be accepted by society but to love God. I always used to think that the homeless could never be Christian because of their tattoos. Or because they seem dirty to us because we are blinded by the luxury of taking showers every night. I was proven wrong at this church service. I could feel the Holy Spirit in the room, in the hearts of others and myself because I realized that I was wrong. I was humbled. My opinion of, “don’t judge a book by its cover,” was put before my eyes. I realized that just because they are homeless doesn’t give us the power to take away their right to faith. Sometimes I find that the homeless are motivated to be connected with God more than us. God loves everyone of us. Whenever I think the homeless should not be treated the same as me, I will be reminded of this moment during the trip. No matter what kind of Study it not only will provide you with more knowledge but it will set you free. The question is how do you study? Is it memorizing a page just to pass a test and then throw it away later? Instead we need to study not for one time but learn for the rest of our lives. Is study just scratching the surface instead of engaging in the deeper realm of understanding? “Let’s learn to ask questions.” ( Foster 75 ). Study must involve humility. You have to release the thought that you know everything and don’t have to be taught anymore. You will never learn if you come from the lens of I know everything and I don’t need more knowledge. “We must come as a student, not a teacher.” ( Foster 66 ). To completely connect with what you study you must include these four steps into your routine. First you must have repetition, then concentration, comprehension, and lastly reflection. “With innumerable murders being portrayed each evening on prime time TV, the repetition alone trains the inner mind in destructive thought patterns.” ( Foster 65 ). Learning is just one big circle sometimes you have to come back to the start to progress. Sometimes you have to repeat something you’ve already learned in order to attain something new. “Study simply cannot happen until we are willing to subject to the subject matter.” ( Foster 66 ). If you are distracted and cannot completely submerge in your study your mind will be in more than one place and you will feel that your work is impossible. If you De-attach from noise, crowd, and hurry you will be able to listen and comprehend. “This Eureka experience of understanding catapults us on to a new level of growth and freedom. It leads to insight and discernment. It provides the basis for a true perception of reality.” ( Foster 66 ). Without comprehension we wouldn’t be able to apply it to ourselves. When something is applicable to ourselves we automatically are able to comprehend it better because of the experiences we had in life. Although coming together and reflecting the topic almost always changes our comprehension. “Although comprehension defines what we are studying, reflection defines the significance of what we are studying.” ( Foster 66 ). Reflection is one of the most important steps. If you do not reflect you won’t be able to reach a deeper level. Reflecting is the step that opens your eyes to possibly to change. What you thought at the beginning might completely be muzzled when you reflect. What if all of this study didn’t have to be just from books. There is a fine line between verbal (books) and non verbal study. When you study books you need to have experience, other books to connect it to, and a live discussion to reflect the book. When you study non verbal you need to study nature in respectful observation, become friends with the animals, and to observe the relationships between humans. “The handiwork of the Creator can speak to us and teach us if we listen.” ( Foster 73 ). Listening to humans interactions will help understand who you are. You shouldn’t judge people when we do this. If we have a judging attitude while studying humans it won’t teach us anything. We almost need to wipe our mind clean so our automatic reaction is not to judge someone but instead to have an open mind. If we truly commit to our study we will find that study won’t harm us if we don’t allow our laziness to control it. 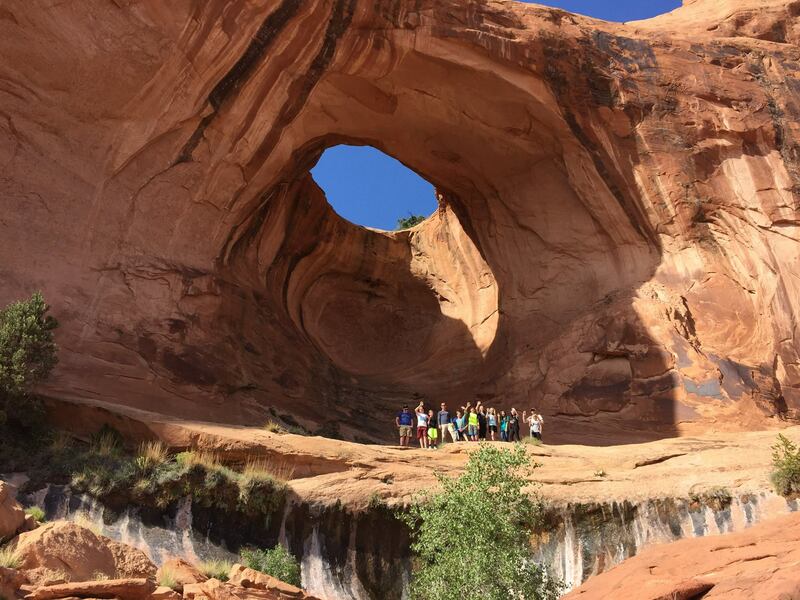 Last week our 6-8 grade students traveled to Moab for four days of expeditionary learning. Below are their post-trip reflections. Learning outside of the classroom is powerful! Moab has given me a spark. We always talk about the trips and how much they mean to us, bonding, hiking, climbing, and being adventurous which is probably what you’d expect from a bunch of middle schoolers going on an out of state trip. What the casual observer doesn’t realize is the spark, the spark in the eyes of everyone that went on the trip telling their favorite story or memory, the spark of an adventurous kid not needing responsibilities or to feel like a grown up, but who can just be a kid. This is the spark of someone who’s experienced community and solitude, adventure and relaxation, I see this spark in the eyes of every one of my classmates after these trips, after the adventure. The spark of adventure, and passion, and courage, and power, and joy. Moab was such an awesome experience. Not only did I enjoy the planned hikes (which made me feel accomplished afterwards) and the astronomy class, but the little moments as well. Jumping in the river, eating pizza and blasting music at midnight, and laughing around the campfire were just a few of the special moments I will remember forever. I enjoyed this trip as much as if we would have spent thousands of dollars on a fancy vacation. All of my classmates have made every moment complete. Weeks of planning and preparation for this trip may have seemed stressful and hard, but it was all worth it in the end. This trip made me realize how much I love all of my friends and every moment I spend with them, and how much I will miss them when life goes on. Spending time in Moab was not only a great time to bond with our classmates, but it was a time of peace. I really enjoyed going to Moab this year, not only was it one of my highlights yet I would like to go back very soon. My favorite thing I did on the trip involving our group was probably bowling. The reason for that is I got to learn lots about the others around me through small talk that never would of happend if it wasn’t for these trips. I thought it was really cool, and I hope the best for my classmates that are moving on. I sit alone, breathing in the warm desert air through my nose and out through my mouth. In and out, in and out, in and out I listen to my slow, rhythmic, breathing. I listen to the birds, hiding in the cover of the trees and shrubs. I listen to the wind howling through the canyon, blowing years upon years worth of dust and sand into my eyes. I watch two lizards darting through the rocks chasing each other. I look out over the valley and sigh contentedly, and for the first time in a long time I am content, I am at peace. Moab! It was such a fun trip. There was lots of excitements like riding in the van, doing hikes that we didn’t want to do, and lots more. One of the many highlights was jumping in the river and having fun with my classmates. I had a really fun trip because I got to bond with my classmates and I have the chance to really connect with them before I left for high school. It will be so different leaving for high school and not to have the special bond with them like I did on this trip. It is easy to say hello hard to say goodbye. It will be hard not to have such a tight community when I enter high school and I will have to start all over again and find the right group. It is hard to say goodbye to a person but people who mean a lot to you or like family is going to be extremely hard. Going into the Moab trip I was really excited. I had never been on a car ride for that long but when we were about 2-3 hours in I lost time and had fun with my class. When we got to the site, we saw that we were by a river! We were super happy. It took around and hour to 30 minutes to set up camp, then we hiked up to corona. This was my favorite arch because I had seen it almost everywhere and I was finally here. We walked around and saw Morgan. Who we hate now. The first day there was amazing. The campfire that night was a cool experience. The next day we went up to arches national park and hiked around there. I had a enjoyable time talking with everyone. After the hike we were all exhausted and I fell asleep in the van. Later that day we stopped for some yogurt and the park. We also swam in the river and jumped of a ledge. I flipped and hit my face on the water but it didn’t hurt. The second day was a blast. We played mafia that night at campfire and did speeches. That night it was super windy and I hardly got any sleep. 3rd day!!! We had a big, tiring day ahead of us. We hiked 11 miles and at first I was not excited, but it was entertaining getting to know everyone again. That night we went bowling and I did really bad, but on the bright side, I had so much fun playing pool and it made me happy when I went up and everyone said, “come on flacco!” We drove to the astronomy place and we had a fun conversation on the way there. That was probably one of the best things ever. All the girls crashed that night. The next day was sad. We were leaving. After a long time in the van everyone was really bored and sad. It was great to be home but sad to be away. Wyoming was a trip getting to know everyone, Santa Barbra was a trip to get closer as a class, and now Moab was a trip being able to say our goodbyes. It is amazing how far we have all come as a class and now our year is pretty much over. There were so many amazing experiences on the Moab trip. My favorite part of Moab would have to be the whole Wednesday. The 14 mile hike was really hard but I actually kind of enjoyed it. And after that hike we were able to go bowling. I had so much fun playing bowling and pole and then going to the parking lot. Then to top it off we got to go look at stars and drive home listening to music and lighting glow sticks. Moab was a trip I will never forget. We all need to stay connected to our inner solitude. Although, staying connected with others is entertaining, solitude is vital for us to be able to have inner peace. Nature is peaceful. It does not talk nor think, but makes us think. This mindset of discovery in nature brings knowledge of not only God but ourselves. We should take advantage of our earth while we still have it before the pollution of humanity kills. Universal language, connection with nature. “I want to be able to look at and into a juniper tree, a piece of quarts, a vulture, a spider, and see it as it is in itself, devoid all of humanly ascribed qualities even the categories of scientific description.” (Edward Abbey) Get away from man’s way, find peace in the music of nature. Wind. Dirt. The river’s song. Calm and beauty are found in the black, protecting sand. Beauty is found in every speck of rock that curves and forms the arch. Be still, find peace in God’s work. One of the best things a person can do (In my opinion), is to get away from the everyday garbage that consumes our lives. The constant rush, the pressure, the endless business. We ought to go away and experience nature’s extravagant beauty. The trip to Moab we just went on was an opportunity to do this, escape, to get ourselves lost, enclosed in the wilderness. The truth however is our regular life is full of borders, pressure, and schedules. Things we are taught to live by. They maybe necessary at times but these things kill us. These things flatten our lives. Cities are cool and all but towers of rocks and trees are much more awe inspiring than the twisted towers of metal we dream of building. Animals are better than cars. Nature is a medicine, a quiet place to think. An endless border less place to explore. Yesterday we went delivering meals to people who can’t get out of their homes or who need the help. We went to ten homes. My favorite one was a guy who had a puppy. It was an American Bulldog. I had a few connections. It reminded me of Juárez. They are also happy which made me happy. We went to a cool grocery option called the Grow Haus. It was also a greenhouse. We had a lot of fun serving. It was a good experience. 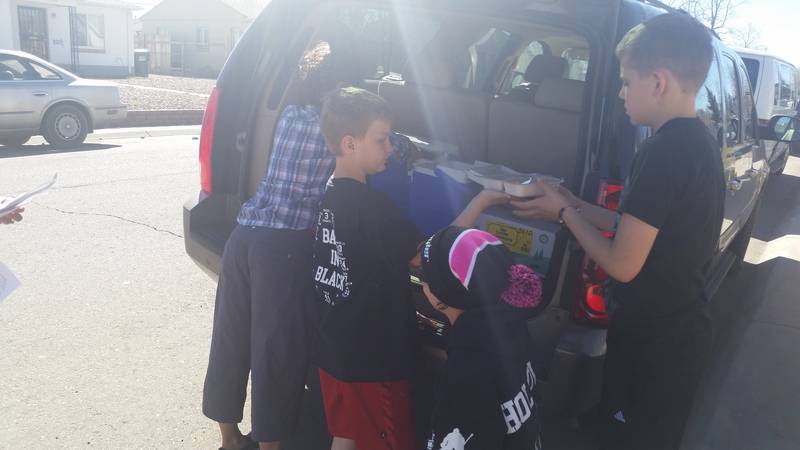 Yesterday we delivered meals on the wheels. It was great! The people I gave the meals to where Hispanic. One person named Rosa was not even the one getting the meals, she was the neighbor. When I saw the the lady with a bent back I knew what I was doing was the right thing. When we went in the only fresh food store it was cool that this community was teaching how to cook fresh food. That trip was a great experience to learn about different communities. I learned while serving at Meals on Wheels that some people live in small houses and they actually know their neighbors well. I thought it was cool we could be a part of helping people who can’t get out of their house so we deliver food to them. We also got to go to the Grow Haus and see where they shop because there is no grocery store. The Grow Haus grows all of the food there and bakes all the bread. We went to 10 houses and we met the people and we went in the houses. you would think the houses would be dirty, but they were not. They were clean and bigger than you would think. I am helping other people and that is what you should do. The people are nice, but some people think of them as dirty people who have no money. I would go on this field trip every day and I would not get bored. I think Meals On Wheels was an awesome place to go! I enjoyed it because you got to do what the Lord wanted you to do, SERVE! It made me think I want to be a missionary when I grow up because I love seeing their smiles on their faces and knowing how their lives been and some of their stories. They are so so sweet and nice and serving them felt great! I loved seeing where they grow their foods and also I loved learning how all the cycles go into place. 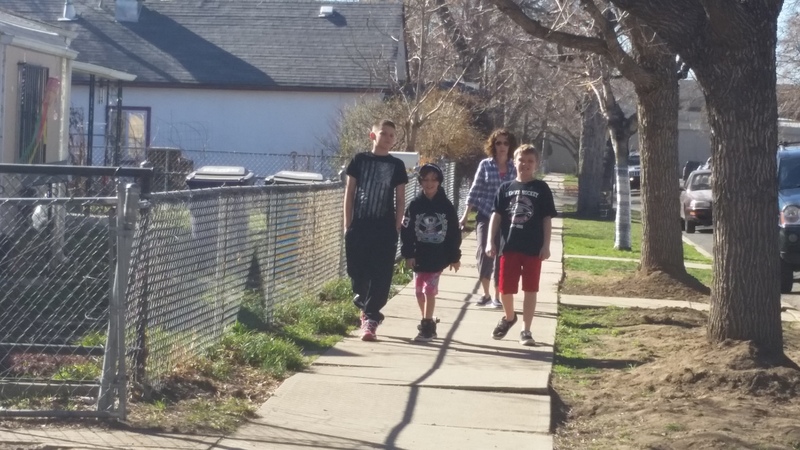 Yesterday, we helped with a service called Meals on Wheels, and we delivered meals to people who can’t always go out to get them or are handicapped. When we where delivering them, I thought their houses were a lot different than our houses. When comparing them, their houses were a little run down and had a lot of things all over. The people inside the houses you may think were mean, but when you talk to them, they are really really really sweet and nice. It was also super super super nice because one of the ladies got the food for her neighbors. 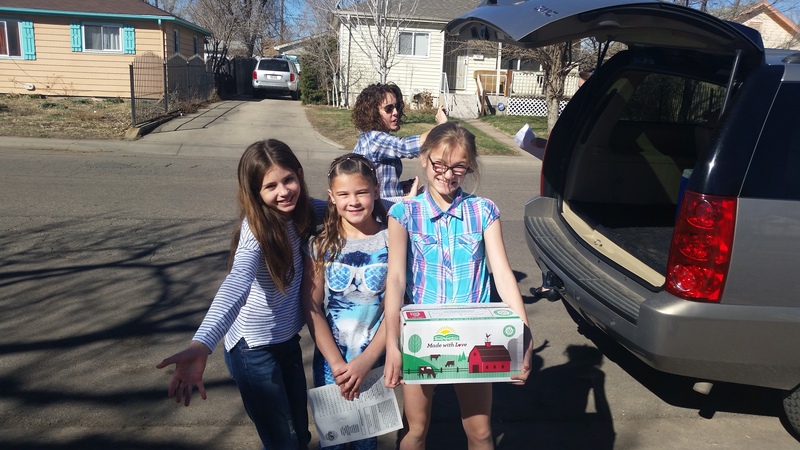 Yesterday we delivered food to people’s houses through an organization called Meals On Wheels. We went to people who didn’t have a grocery store near them, so it’s hard to get food. The houses were little. Some of them were pretty nice. Most people were very grateful for what they got. I was surprised about how nice they all were. Since there was no grocery store near them they had a place called the Grow Haus. The Grow Haus is a place where they grow food in a huge green house, then they sell it very cheep. Everybody there was so nice. They also teach the people how to cook the food into yummy meals. After that we went to a few more houses and then we went back to school. This experience made me feel happy and good about myself. Mrs. Gibson also came that same day. She talked about her experiences with homeless people. One of the homeless people that was apart of her life was named Felicia. Although she was a drug addict, Mrs. Gibson still loved her. Felicia was so open to Mrs. Gibson and was willing to share her story. Felicia was like the people we met at meals on wheels. They were so open to share with us there story’s. They just invited us right into there house. Even though some of them are dirty houses. They didn’t care. I think the point of this was to try to open to more people in lower positions than us. They all have story’s and there all people. Yesterday we helped serve meals on wheels. Meals on wheels is a program that helps the people that can’t get food on their own. My teacher was driving the school van with all my class mates in the van. We served to the people one hot meal and a sack lunch with milk. We went to ten homes. One guy that really stood out to me was well I did not know his name but he had a American Bulldog puppy and if you don’t know me that well I love animals, back to the little pup she had one blue eye and one brown eye and her name was blue because of her one blue eye. But something with Blue’s story really stood out to me, her mom and dad lived across from the owner of blue, Blue and her owner looked like they really cared about each other. The neighbors seemed like they were a family and they were not scared to let someone in there house. On Monday we went to go to deliver food to people who can’t really get out of there house. I connected to this because we served. I kind of made me a little nervous because I’ve never seen these people before and been to that area. We delivered to lots of people and got to have very short conversations we stopped by this place called the grow haus. They grow so much stuff there like tomatoes potatoes and had aquaponics to. My class delivered to two houses. We delivered to ten houses. We came back and ate these floweres we got from the grow haus. We tried them and it was SO SPICY!!!! My friend Samantha spit it out and drank lots of water. We had a surprise guest who came it was my friend Charliegh’s mom. She talked to us about these homeless people she met. the first one was her in California she was jogging on the beach and saw thins homeless lady she pretended to stop and tie her shoe and stretch. She said hello but there was no response. she said hello again there was no response. So she came back the next day and walked up to her this time Mrs Gibson said hello she said hello back. They had a big conversation. Mrs Gibson walked back to her apartment. she came back the next day she was gone. Mrs Gibson ran to the police station and said have you seen this woman. Do you know her last name. she said no we can’t track her down. Mrs Gibson never saw her again.